1. The price was good 2. Bed was fine 3. Room size was fine. -The front desk staff were nice. -The lobby was spacious. -I booked last minute, and it's a cheaper place around Maastricht. -It seemed clean and I liked that the cleaning staff came back after we had left (way after they had gone through the floor) to clean our room. They saw the "do not disturb" and didn't knock or anything. On check-out day, we'd requested a late check out and the cleaning staff didn't bother us at all that morning. I really like that. 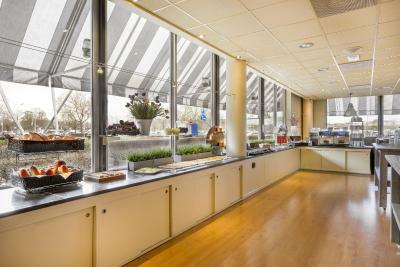 Rather good continental breakfast, not too crowded in the mornings, very nicely decorated breakfast hall and reception. Very clean room and cleaned neatly every day. 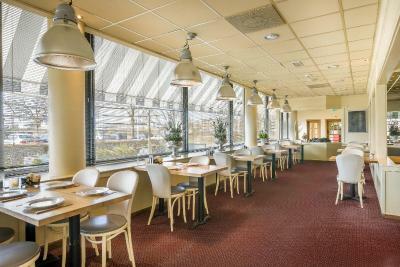 Rather friendly staff at the breakfast hall but not so at the reception(could not bother to greet guests in the morning or smile due to too busy with own office work, maybe because it's a business hotel and so less personal). The decoration with some arts next to the reception ! First, the location is just about OK, being 15 minutes walk from the train station. Second, the hotel itself offers good value for money, when it comes to comfort (bed mattress great, pillows OK, warmish room, bathtub and spot clean). I did not try their breakfast, as it wasn't served early enough for my needs. I used the nearby McDonalds which opens at 7 am and it's only a 2 minutes walk. 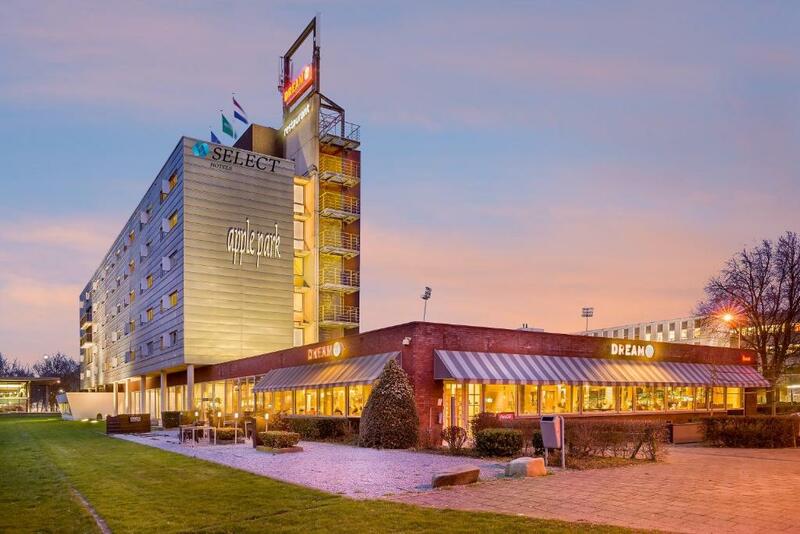 Select Hotel Apple Park Maastricht This rating is a reflection of how the property compares to the industry standard when it comes to price, facilities and services available. It's based on a self-evaluation by the property. Use this rating to help choose your stay! The modern-art décor Apple Park Hotel Maastricht is located on the edge of the historic center in scenic green surroundings. It features two terraces, free Wi-Fi throughout the hotel, a solar charging point for scooters and electric bicycles, and a fitness room. All of the sound-proofed rooms at Apple Park Hotel Maastricht have extra long beds and climate control. 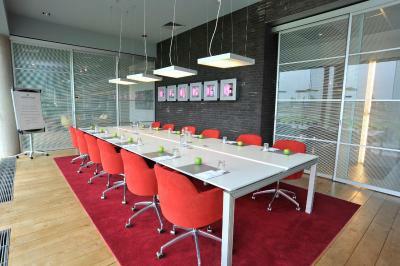 They also include flath screen TVs, tea and coffee-making facilities and a work desk. Dreamz Restaurant & Bar serves a wide culinary variety including local dishes for dinner and lunch. It also has an extensive wine menu. The public in- and outdoor swimming pool 'Geusseltbad' is located just around the corner. The Vrijthof square is located 2.2 mi away and there is a direct connection with a bus stop at a walking distance from the property. On Fridays and Saturdays at fixed hours, a free shuttle service is available to the city center. The Maastricht Railway Station is a 5-minute drive from Apple Park Hotel Maastricht. 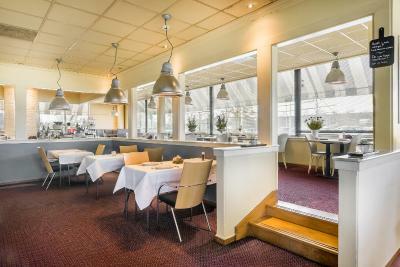 Maastricht Aachen Airport, the conference center MECC, the historic town of Valkenburg Aan De Geul and the beautiful hill country are less than 15 minutes away by car. Witte Vrouwenveld is a great choice for travelers interested in city trips, sightseeing and city walks. 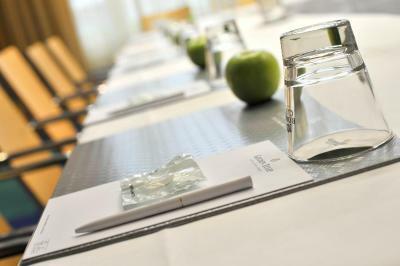 When would you like to stay at Select Hotel Apple Park Maastricht? 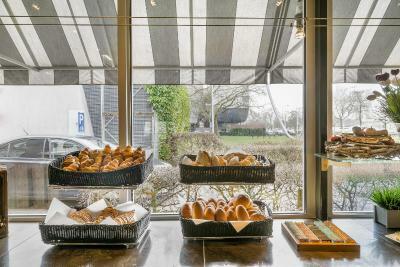 Come to Apple Park Hotel Maastricht to enjoy picturesque Maastricht. 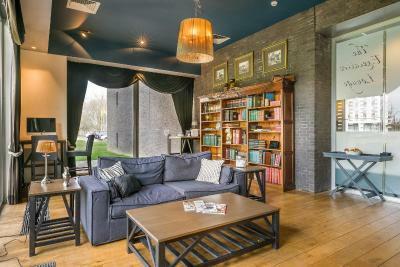 Our ecology-conscious hotel is ideal for visiting the ancient city of Maastricht in southern Holland. Its beautiful old buildings in the city centre and the nearby gentle hills of Limburg make Maastricht a popular tourist destination, and its position in the Meuse-Rhine Euroregion makes it a key destination for business travellers. 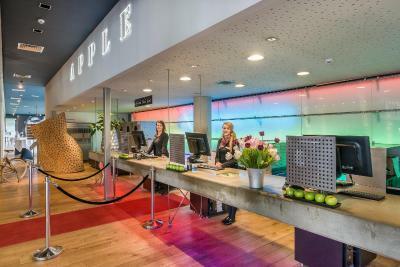 House Rules Select Hotel Apple Park Maastricht takes special requests – add in the next step! Select Hotel Apple Park Maastricht accepts these cards and reserves the right to temporarily hold an amount prior to arrival. It is possible to book an extra bed including breakfast at an extra charge per person per night. Please note that this is upon request and needs to be confirmed by the hotel. Please note that the hotel offers a taxi service for an extra charge. - The service is not available from the city center back to the hotel, and it is only possible to make a reservation for the bus upon arrival. The room was hot, and I had to keep the window open as the air con appeared not to be working. The two single beds were small and not very comfortable for a big man. I booked a room to myself for comfort and sleep and sadly got little of either. I was put in a double, instead of a king, as I was traveling alone. The duvet for each bed was so narrow that I had to use the other bed's one as well, to keep warm. But both being so narrow, it was just awkward. Stayed in for one night while on business in Area. Modern hotel with big rooms. Excellent service and close to motorways for traveling. Good and complete choice for breakfast. Will stay here again in back in the area. The quality of the rooms, the comfort and cleanliness are not good enough for a four star hotel and could be much better for the price per night. The staff was very kind and efficient. They kindly provided the invoice very quickly and with no mistake. The hotel was quite and perfect for rest and less than ten minutes from the centre of Maastricht. It was difficult to regulate the temperature of the room. It was often hot and the window needed to be opened. The beds were squeeky or wobbly. 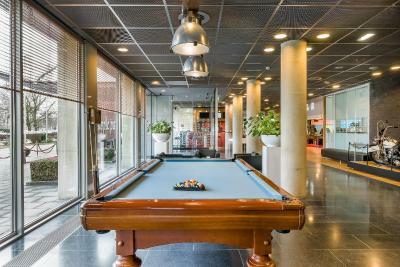 Good location, easy to walk to the busstation or center of Maastricht. Many items to choose for breakfast. Quiet location depending which side of the hotel that you are sleeping (office building and football stadium or lake side). I liked the free shuttle to the city in the evening. Had asked for one large bed, but got twins next to each other. Got changed next night. Staff needs to improve attitude. Not the new hotel, but still Ok. A bit far from the city centre. Big parking, gas station is close to the hotel, comfortable route to the highway.